When Helen Molesworth, chief curator at the Institute of Contemporary Art, examined the contemporary art world, she found that the 1980s remained vastly overlooked. “Why is our memory of the ‘80s kind of a cringe of embarrassment?” Molesworth said. Pop culture depicts the ‘80s as a collection of fleeting fads, bad pop, hair perms, the Rubik’s Cube, hair metal and neon everything. But at a closer glance, the ‘80s were a transformative, tumultuous decade. Women began carving out a more solid place next to men not only in the workplace, but in the world of art as well. Mass media publicized the private sphere and strengthened the desire for social justice and democracy that had emerged in the heady 1970s social movements. The AIDS crisis at the end of the decade ignited feelings of loss and longing. Molesworth sought to capture all this in the unprecedented four-part 1980s exhibition that opens at the ICA today. The exhibit itself — broken down as “Gender Trouble,” “The End is Near,” “Democracy” and “Desire and Longing,” — is unexpectedly relevant. And though Molesworth nailed it, she said the exhibit is merely a first shot at what an ‘80s show might be. The exhibition covers 1979 through 1992 and includes work by David Hammons, Hans Haacke, Cady Noland and Guerrilla Girls. This Will Have Been: Art, Love and Politics in the 1980s captures the very recent history and perhaps the last especially memorable decade perfectly because not only is it full of tangible studio art, but it also contains videos and sound clips. Molesworth said that a 1980s art exhibit would fail to capture the first ever truly mediated decade if it didn’t include these elements. A 10-minute edit of Charlie Ahearn’s Wild Style plays at the entrance of the first room, “Gender Trouble.” In the same section, Jeff Wall’s “Picture for Women” accurately portrays the intensity of changing gender roles. A woman gazes into a mirror, appearing wistfully alienated, as the photographer stands behind her, meeting her eyes in the mirror, as he too is photographed, as if he understands how women feel as constant objects of attention. In the same section, the American cowboy, a classic portrayal of man, is ridiculed and shows the 1980s rejection of old definitions of masculinity. “The End is Near” grasps the apocalyptic tone of the ‘80s. Modernism was at the end of its road. Traditional conservatism was dead to the art world despite President Ronald Reagan’s threat to bring it back. By then, concepts from the 1960s were hackneyed, too. In a five-minute video, Christian Marclay plays Jimi Hendrix’s version of the “Star Spangled Banner” from Woodstock on a turntable, simplifying and mocking the long, narcissistic guitar solos. Punk’s brevity at the time sought to do the same. 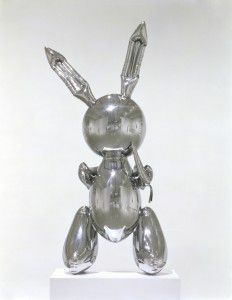 The perfectly vain Jeff Koons “Rabbit” sculpture stands in the center of the “Desire and Longing” part of the show. Viewers themselves are reflected off the stainless steel, and they get to have their own personal moment of self-desire — a concept the ‘80s grappled with. AIDS wallpaper is featured on another wall. “It’s doing what AIDS was — a constant backdrop against which everything happened,” Molesworth said. Molesworth’s exhibition is a bold and well-composed, setting a high standard for period exhibits to come. The first of its kind, it is an eye-opening depiction of the 1980s art world as progressive, inspiring and heart-wrenching. This Will Have Been: Art, Love & Politics in the 1980s is on display at the ICA from Thursday, Nov. 15 to March 3.